I fortunately found Sorhay in Casco Viejo and immediately booked a trip to the San Blas Islands. I was pleasantly surprised the next morning to have Sorhay greet me at the hotel at an early 5:30am pick up! Everything ran smoothly and the trip was definitely the high point of my Panama adventure. I enjoyed it so well, that she tailored a trip for me to Monkey Island and the Pipeline trail the following day. And last but not least, Sorhay provided my transportation to the airport upon my departure. I would highly recommend her and The Real Panama Tours to anyone and everyone! These are one of our most beautiful crystal clear water beaches in Panama and the world. For sure!!! ​The Guna Yala Archipelago has more than 350 islands. Many of those islands are still virgin. Our tour visits 3 islands of different sizes and shapes. Of course we go to the famous Perro Island were you can swim around the underwater ship. We also make sure you can mingle with the locals at Isla Tortuga and take you to the Natural Swimming Pool with starfish. (We kindly ask you not to take the starfish off the water). The value of the cabins vary based on your preferences and amenities. We have camping, cabins with and without private bathroom, etc. Spending a Night at San Blas, may not be enough, Only 1 night in Paradise? Basic traditonal cabins share shower and bathroom. ​Wood cabins are totally private and have their own toilet and bahroom. For cabins on the water, pelase contact us. Icodub: Mid size island. 10 cabins. Rustic and Wood Private cabins available. Some cabins have private shower and bathrooms. The beach is beautfdul. Asserbayaladup: : Mid size island. Private Rustic cabins only. Shared bathrroom. The beach is beautidul. Diablo: Mid size island. Private Rustic cabins only. Shared bathrroom. The beach is beautidul. Waili: Private cabins on the water. Only 10 cabins. private shower and bathrooms. Seasonal island, Recommended December through March. During the rest of the year, due to no wind, may have sand flyes. Tortuga: Tiny island, Gorgeaus. Only camping. Beautiful corals around. One of my favorites. Kikirdub: Small island. Cabins are gorgeaus. No beach. The closest beach is at 10 minutes. Away from other toursity islands. Unique. Small Dog Island: Small - Mid size island. Big house - Private rooms. Shared bathrroom. The beach is beautiful. It cost more than any other island. I know you have a looooot of questions about San Blas. Quite honestly I don't understand why so many concerns. San Blas or Guna Yala is not in Jupiter or Mars. It is right here. San Blas is simply an autonomous indigenous reservation, with their own rules. It belongs to Panama, however, they have different customs and traditions and a General Congress that makes the important decisions. The indigenous are normal people. - Daytours depart at 5:20 am and return at 6:45 pm approx. How is the weather in San Blas? No one knows. I understand you want me to say is going to be sunny and beautiful but the true answer is: In Panama in general, the weather is UNPREDICTABLE. Either will be sunny or rainy. That's it. For sure it is not going to snow. No one, absolutely no one will be able to tell you what you want to hear which is: it is going to be a perfect sunny day. The advise is to enjoy the day as it comes and please, dont stress me or yourself looking at the forecast. Please! How far is San Blas and how long does it takes? It is 2.5 hours away from Panama City, including a short stop at supermarket. All the tours start at 5:20 am and you should be back by 6:45 pm. How much time do we spend at each island? Approximately 1 hr and 45 minutes on each island. You visit 3 islands including the Famous Perro Chico (Small Dog). The other islands would be chosen by my team based on the weather. Normally the other islands are one of the following: Icodub, Aroma, Devil's island, Big dog or Waili. You will have 20-30 minutes at the Natural Swimming Pool with starfish. Do we have interaction with indigenous? The Real Panama Trs Team at San Blas is 100% indigenous and has been trained to meet the foreign visitors standards. From the moment you are picked up, you are in direct contact with gunas. At some islands you will have the guna ladies working on their famous molas. They speak basic english. They understand basic commands. Remember that you are visiting their territory, therefore, they don't have to speak your language, they have their own dialect. We should be polite and try to communicate with them because that is part of the experience. How? smile and sign language. Since it is a structure tour, basically island hopping with lunch included and everything pre arrange, you will be ok. The Real Panama team in San Blas knows exactly what they are doing. I am Sorhay and I am available by phone and always doing follow ups with my team. Why do we have to leave so early? San Blas It is 2.5 hours away from Panama City. We nomally arrive around 8:45 am, depending upon traffic. From the port of Carti it will take about 30 minutes to get to the 1st island and from the 1st island it will take less than 10 minutes to visit the other ones. Why does it cost $155? Taking anyone to San Blas involves many expenses: Private Transportation back and forth, only in 4x4 vehicles, experienced drivers with permit, entrance fees, port taxes, island fees, boat fare, lunch among others. Are there mosquitoes or Zika in San Blas? As any caribbean island with palm trees, there may be a few. Nothing to be worry about. No reason to be concerned about Zika either unless the panamanian authorities raise an alert. The islands you visit are not located within the indigenous communities and have the basic infrastructure required for tourists such as bathrooms. ​We are always aware of any news to keep our guests safe. How many people per vehicle and how many on the boats? 6 which is the maximum allowed per vehicle. We can arrange private transportation for an additonal cost. Our boats, on the other hand, have a capacity for 20 people. Normally the boat is shared. It is common to get on the boat with indigenous people because indigenous help each other to move in between islands. Is there a refund if it is raining? 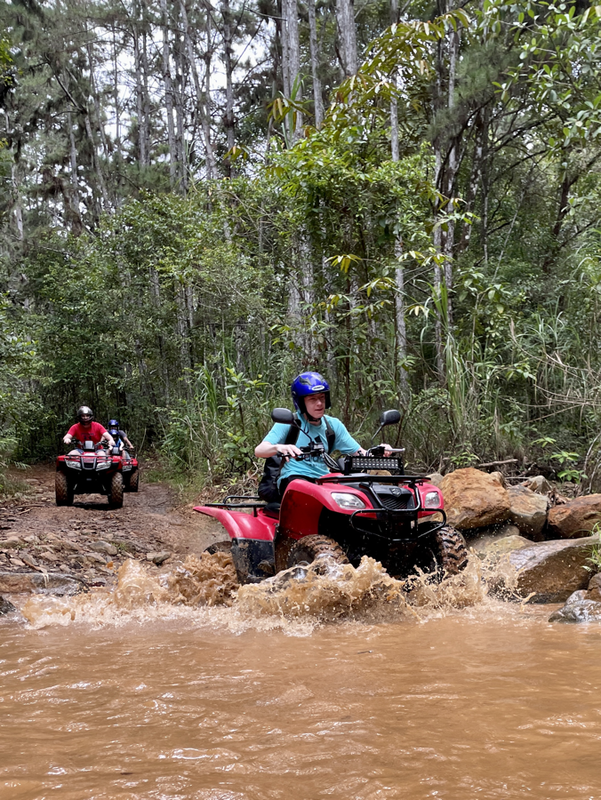 Before you book this tour, especially during our rainy season, keep in mind that from the moment we make the reservation we are holding a seat for you. That money is not refundable unless one of the 2 reasons explained above applies, only those 2 reasons. It is very important that you understand, only a minimum amount will be returned if the tour already departed from Panama City. Again, we don't cancel tours if it is raining in Panama City because that doesn't mean that is going to be raining in San Blas and WE are the ones that will make that decision. We don't cancel tours based on the weather in Panama City, simply because Panama City is 2 hours away from the islands on the Pacific side. We have to drive over to Carti to make that call. There is no way to determine how the weather is going to be because it could be raining at 5 am in Panama City or at San Blas and it may stop at 8 am or during the morning hours. Most of the time, if our guna team forsees bad weather or receive an alert before hand, we will notify you and provide a full refund if that is the case. This only applies if the tour has not taking place. When you are going to San Blas, go with an open mind, expect the best, don't stress me or yourself about the things that are outside of our control such as weather and traffic. Please, please, please! Be kind to our indigenous team that works hard from 4:15 am. Everyday we are on the streets are 4:00 am getting the cars ready, clean, checking the tires, picking up passengers and then we drive for 2 hours each way safely. It is not easy. Your driver is back in the city around 7 pm and gets back home at 8:00 pm. Please be considered with my team because they do their best to serve you. Be kind to all the indigenous people that you will encounter. Remember what we give, we receive. The Real Panama Trs indigenous team is organized, professional and mindful and they are also humans. During high season, due to the amount of people visiting, it will be hectic. Be mindful if you book a tour on the weekends. Weekends are the busiest days and it would be crowded. If you can do the tour on a week day it will be better. Treat our gunas with respect, lower your expectations a notch and be thankful for the opportunity to visit the amazing islands of San Blas.